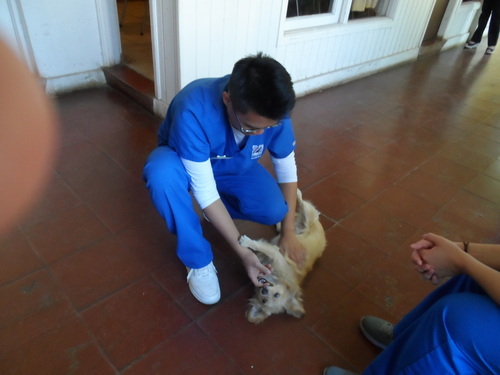 Henson Phan plays with Luna who is the “pet therapist” at Hospital de Dia. After spending the day in Talca and visiting a psych hospital; I have much respect for these psychiatric nurses who are taking care of these people. Our first visit involved an inpatient psych facility that housed A LOT of patients. We were supposed to arrive at the location at 9 a.m., but ended up being there at 8:30 a.m. I learned that it was rude in Chilean culture to arrive early, but the staff welcomed us with open arms. A security guard welcomed us by opening the gate that led to the facility. 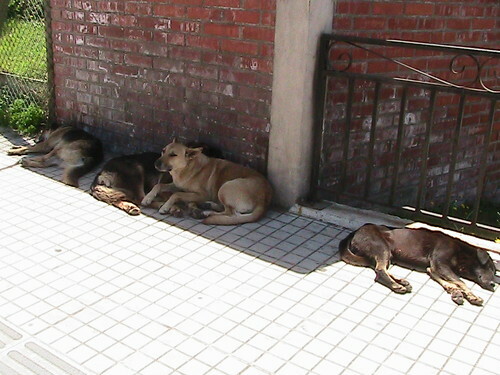 After coming inside the gate, we were welcomed by 3 or 4 patients who were getting some fresh air. All of these patients were most likely above the age of 60, but they all shook our hands and gave us kisses on the cheek. The first thought was “I am in a psych facility. You aren’t supposed to touch the patients; we were told not to in America,” but these patients were so kind that I didn’t feel an ounce of danger. Besides, kissing on the cheek is a way of greeting here so its not like they’re intending to invade personal space. 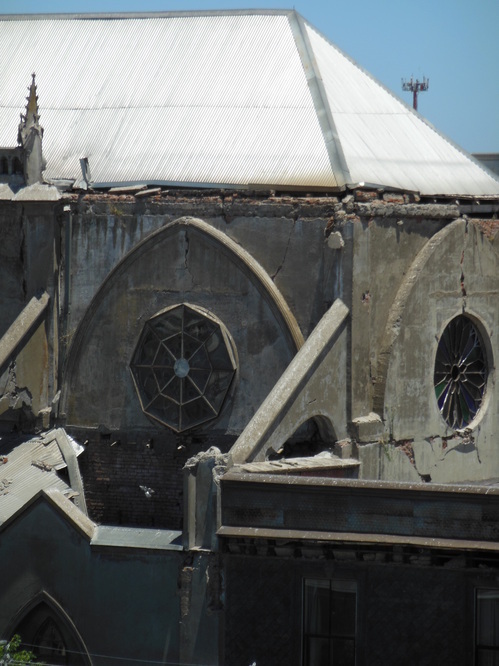 Earthquake damage at a historic church in Talca, Chile. After, we met with more patients, younger patients who have been in the (temporary) inpatient hospital for more than 30 days. The earthquake destroyed the main hospital so this inpatient hospital is actually temporary. Many of these younger patients’ ages ranged from 20-50 and they suffered from depression. Regardless, everyone was interested in talking to us and asking us about the American culture such as music (they all thought that Lady Gaga was “loco”) and movies. The patients seemed to have a good relationship with the nurses. The patients sat in this large recreational room/dining room on these black couches with the nurses sitting directly next to them as if they were friends. This bond that I saw between the patients and nurses did not match what I saw back in the U.S. during my psych clinical rotation. From my experience in the U.S., it seemed like the nurses and psych patients always kept their distances. The depressed patients were always quiet, and I would always struggle to get a word out of them. Finding out that these Chilean patients were admitted for depression surprised me since many were smiling and talking up a storm. Later we went to a different part of the building where they held many of the geriatric patients. Most of these patients did not have family who visited them, but according to the staff,Chileannursing students and others wouldvoluntarily come visit the patients on their free time. All of the geriatric patients were very kind and I probably shook about a million hands within a period of 15 minutes. 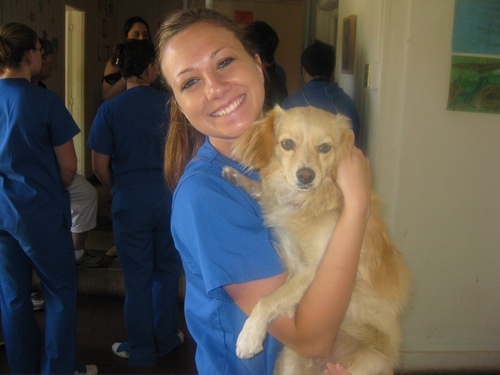 All the patients came up to us holding our hands, putting their arms around our shoulders. Every one of the patients had the biggest smiles plastered on their faces. “Momma” Val even made a new friend when one of the patients followed her around for an hour holding her hand and calling her “mami.” The most amazing thing about this is the fact that there is only ONE nurse taking care of these 80-something patients. ONE. How? I don’t even know. 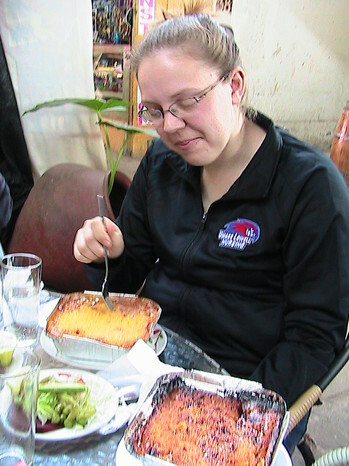 Maybe the Pisco Sours here in Chile gave this nurse super multitasking powers, but I would never be able to handle over 80 patients every day at work. Somehow, the nurse working in this facility makes it happen, and for that, I applaud him. View a photo gallery from the trip. I’m not going to lie, even though its only been a few days, I do miss my American burgers. We went to a small ice cream shop that reminded me of Friendly’s. They also had “normal food,” but their focus was ice cream. I had a cheeseburger with bacon. I know I can’t really expect for the burger to taste the same as an American burger, but it still tasted alright. I still want to try authentic Chilean food, but many of the places that we know of so far cater to tourists, so it’s not surprising to see hamburgers, pizza, hot dogs (garnished with avocados) and other foods that you would expect in the U.S.
After eating, we decided to go on a free tour that was in the middle of a plaza. This tour lasted 4 hours, but our tour guide was amazingly entertaining. He was a chain smoker and probably smoked about 5 cigarettes within a span of 30 minutes, but he was extremely kind and personable. He spoke with a mix of an Irish/Spanish accent about the history and certain key areas of the city. 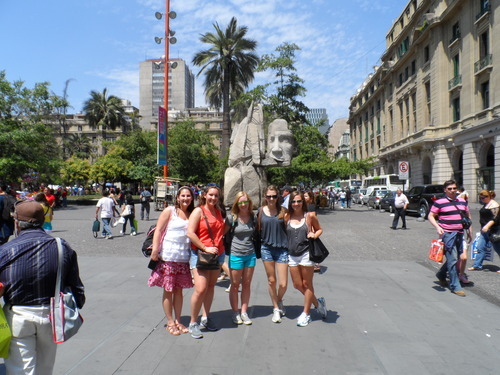 We saw Plaza de Armas, which is Santiago’s main square. They had people painting, dancing, singingand selling various knickknacks. We saw Municipalidad, which is Santiago’s city hall. We also saw the old congress buildings and many other beautifularchitecture. I noticed many cracks and chipped paint on the building due to the aftermath of the earthquake fromFebruary 2010. The earthquake happened on a Friday night at 3 a.m. in the middle of the morning. It was a 7.9 on theRichterscale in Santiago and an 8.8 overall in Chile. 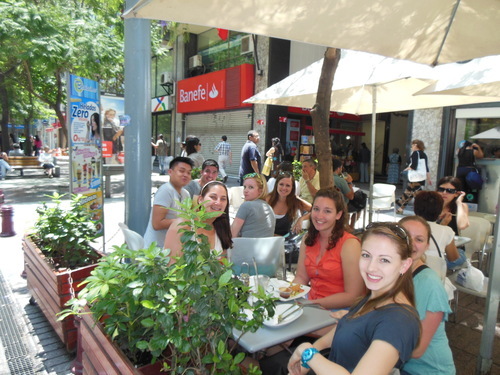 We finished the tour in the Barrio Lastarria at a cafe. After the tour, we went to the flea market to buysouvenirs. 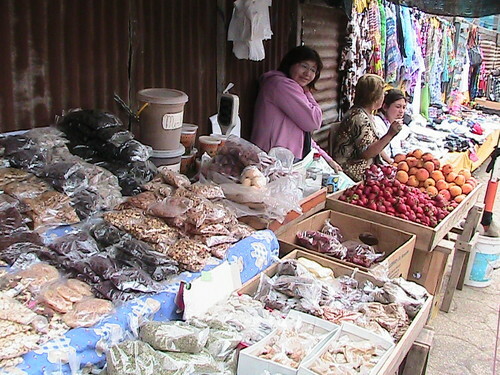 Ihaven’tfound anything I like yet, but hopefully we’ll see some things in Talca! One word. Stair-master. Had we known that we would walk so much, we would have brought more shoes. Our airport experience was less than satisfactory. Leaving Boston, we were stuck on the runway for half an hour due to heavy traffic in New York. Because of the weather, there was a lot of turbulence, but we arrived in sunny Miami at night. This flight lasted 3 hours and 40 minutes, but our next flight from Miami to Chile lasted 8 and a half hours. Most of us had trouble sleeping due to the cramped quarters, but at least the food was decent. We were given a choice of either pasta or chicken. The people who had the pasta said it was decent, but those with chicken said that it was pretty good. 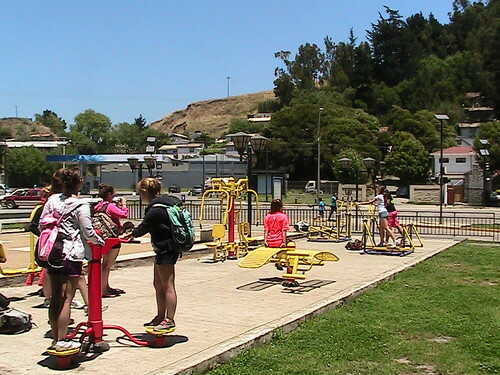 We arrived in Chile at 7 a.m., and our global health experience began. We hiked up a mountain called Cerro Santa Lucia and got a great view of Santiago. Smoking was verypredominant, but the folkof Santiago love to clean. We saw people mopping sidewalks, washing windows, and providing excellent lawn care. Everyone here is super friendly, even though we have a language barrier. It’s a good thing we have Javi and Sarah to talk for us. 🙂 We explored the city on foot and metro. 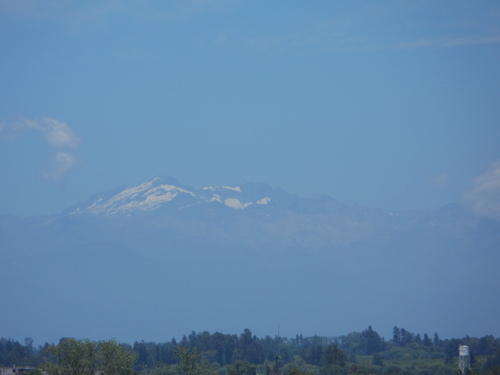 The view from Chile of the snow covered Andes Mountains. We then went to the zoo (TONS OF STAIRS) and saw everything from elephants to penguins to a poor sick cheetah and sleeping kangaroos. By that point we were exhausted, hot and dehydrated, so we headed back to the hotel for a shower and a nap. For dinner we had a traditional Chilean meal with delicious food and service.